Resolution 1: To travel even more miles, to provide the finest tea from around the world, and to report on it all here in the Camellia Sinensis blog. In addition to China, this year's travel agenda includes Japan and possibly India and Sri Lanka. Resolution 2: To introduce more great products for tea lovers, such as 2009’s most popular new product, the Programmable Digital Electric Kettle. In particular, to add a very fine Imperial standard yi xing teapot and other teaware to our collection for 2010. Resolution 3: To produce teas that equal or exceed the quality of our finest teas of 2009, such as Imperial Tribute Harvest Purple-Tip Puerh, Imperial Lotus Heart Dragon Well, and 2009 Monkey-Picked Tie Guan Yin. Resolution 8: To publish an Imperial Tea Court Recipe Cookbook that teaches you how to prepare our favorite menu items, such as our famous hand-pulled noodles, and also gives detailed suggestions on how to brew tea to best fulfill its potential when it's paired with specific foods. Thanks for your enthusiasm and friendship in 2009 and every year, and with your ongoing support we'll do our best to achieve these ambitious goals and more in 2010! 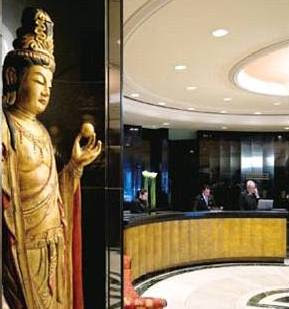 And now another reason to stay in San Francisco's elegant Mandarin Oriental Hotel: through a special arrangement with the hotel, you will receive a 10% discount in our teahouses if you show us your room key! We already provide some of the tea served in the hotel's lobby lounge. But it's an even more enjoyable experience to take the pleasant 5-10 minute stroll through the Financial District to our location in the landmark Ferry Building. We look forward to welcoming Mandarin Oriental guests - and all visitors to San Francisco - to our teahouses! Diablo Magazine just published the article Teatime in the 21st Century, quoting Roy: "Tea tasting [is] much more interesting than wine tasting, says Imperial’s owner and tea expert, Roy Fong. Adding more tea leaves, adjusting the water temperature, or fiddling with the steeping time changes the flavor of the tea, making it more versatile when pairing with food. 'Strong-flavored tea actually goes well with not-so-strong-flavored food,' he says." In an article that focuses on new attitudes toward tea and teahouses, the author paid a visit to our Berkeley teahouse and discussed food and tea pairings with Roy. Among our teahouse specialties called out in the article are green onion pancakes (paired with jasmine tea), jasmine tea shrimp dumplings, and hand-pulled noodles with beef topping and special reserve puerh. 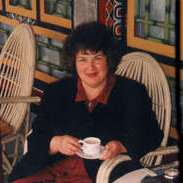 Diana Rosen, author of numerous tea books including The Book of Green Tea, Taking Time for Tea, Meditations with Tea, and many other books and articles, recently sent Roy her response to his book, Great Teas of China. Diana kindly agreed to let us share her opinions with Camellia Sinensis readers. Dear Roy, I loved the anecdotal items, especially your travels and friendships made in China, and it was nice to be reminded of your stories of when you were a child in Hong Kong or when you towed cars at night. I also remember stories of how you would drink tea after a long night. The book not only sustains the credibility you have earned (with much effort) but invites us along with your quests to search out good tea, creating an intimate connection between writer and reader. I appreciate very much learning more about the Chinese names and locations of these fine teas. The description of each tea, how it is grown and processed, gave me deeper insight and makes me appreciate your sourcing efforts all the more. I learned a LOT. It's a pretty book. The type is the right size and the use of the orange background for sidebars is good. My suggestions for future editions would be to add more! More information on how your tea tastes have evolved, perhaps when you like to drink what and why. I'm a sucker for these types of anecdotal stories, such as realizing that by drinking your favorite oolong in a particular pot its patina glows and, perhaps, the oolongs of all those years have actually seeped into the clay. Certainly most American readers will want more information on brewing. You do not need to go into more detail about temperature, although I'm sure most folks would want that, but I stand by your position of encouraging people to experiment. It is their tea and their tea experience and once you convince them of that, they're on their way to the tea life. SAN FRANCISCO, December 9, 2009—Roy Fong, a leading tea expert and proprietor of San Francisco’s renowned traditional Chinese teahouse, Imperial Tea Court, has published Great Teas of China, a compact, readable guide to the top teas from the land where tea was first cultivated over 3,000 years ago. 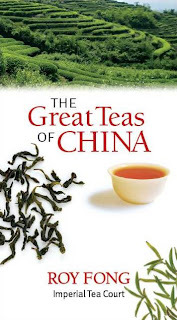 Great Teas of China is a unique blend of detailed factual information about artisanal practices for growing and processing the teas it discusses, as well as personal anecdotes from Fong’s twenty-year career as a tea merchant traveling around fast-changing China. The book covers over a dozen of Fong’s favorite classic teas, ranging from hand-picked West Lake Dragon Well and expertly crafted oolong from Wu Yi Shan, to patiently aged Yunnan puerh. 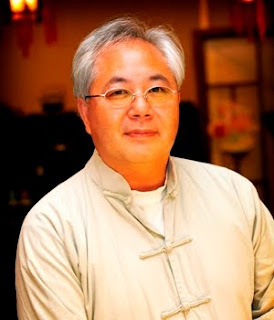 Also included are Fong’s insights on choosing, brewing, and savoring each selection, plus background information on tea farming, local history and culture of tea-growing regions, and artisanal techniques for processing the leaves of Camellia sinensis, the flowering perennial at the heart of Chinese culture. Fong’s fateful encounter with tea began at age six, when he would interrupt his walk to school to watch Hong Kong day laborers’ impromptu gong fu brewing sessions. Later, a chance visit to Hong Kong’s teahouse district unexpectedly set his life on a new course. He began importing Chinese tea to the U.S. and, in 1993, he and his wife Grace opened the original Imperial Tea Court in San Francisco’s Chinatown. Since then, Fong has enlightened and inspired a generation of tea enthusiasts, who visit from all over the world to enjoy the finest Chinese teas available in America. Great Teas of China is a very personal and accessible introduction to contemporary tea connoisseurship. 88 pages; illustrated with color photographs and maps; includes glossary. Today is the last day for preordering copies of Roy's new book, Great Teas of China. We're expecting a shipment from the printer tomorrow so we can start fulfilling orders later this week! Roy has agreed to autograph all preorders, so if you'd like an autographed copy be sure to place your order before midnight Pacific time tonight. If you do miss the deadline, we'll be holding an autograph event in our San Francisco Ferry Building teahouse later this month. We'll keep you posted here on the blog when it's scheduled. We just heard from the printer that Roy's book, Great Teas of China, has been printed and shipped! That means it should arrive at our warehouse early next week. We'll start fulfilling pre-orders as soon as we receive copies. We'll also let you know when it's available in our teahouses. The book is a unique blend of Roy's personal insights and detailed factual information about all the teas it discusses. We can't wait to take the wraps off and share it with you! Last chance for pre-orders is Monday, December 7. Roy will autograph all pre-ordered copies. Orders after Monday will be fulfilled from warehouse inventory and won't be autographed. The epic Chinese historial action movie Red Cliff (赤壁) arrived in theatres here in San Francisco a couple of weeks ago (nearly 18 months after premiering in China). Famed Hong Kong director John Woo's first Chinese movie since 1992 and, at $80 million, the most expensive Asian movie ever made, it's packed with martial arts; gory combat; larger-than-life buddy-heroes; top stars from Hong Kong, Taiwan, and the mainland; sly winks at some of the most famous scenes from Woo's earlier films; and - less predictably - lots of tea-drinking! It turns out the Xiao Qiao character, played by Taiwanese model-turned-actress Lin Zhi Ling (pictured here), is quite expert at grinding cake tea into powder and whisking it up in a cha wan. (Close scrutiny of the credits reveals that the actress was trained by a tea expert.) 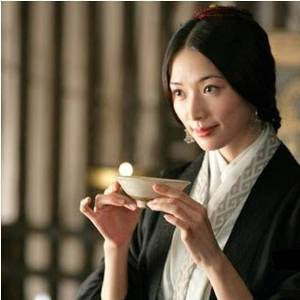 Late in the movie, when she makes tea for arch-villain Cao Cao (veteran actor Zhang Feng Yi), we aren't sure if it's her tea or her lecture on brewing technique, covering such details as water and tea tools, that gives Cao Cao a terrible headache. In any case, he's indisposed long enough to give Xiao Qiao's husband Zhou Yu (mega-star Liang Chao Wei) enough of a military advantage to defeat Cao Cao. I saw the Western version of Red Cliff, trimmed down to a mere 2.5 hours. The Asian release is in two parts totaling 4 hours or so, and probably contains even more tea scenes. Many will watch Red Cliff because they're fans of John Woo. Others will enjoy the stunning scenery, epic battle scenes, historical narrative, host of charismatic stars, and sophistication of contemporary Chinese filmmaking. However, for some of us tea is the draw. It's gratifying to see a movie that's as serious about the tea history of 1,800 years ago as it is about the military history, and to watch a grand, complex plot - and the course of history - turn on a timely lecture about how to brew a good cup of tea.